This is the first thing every new bloggers will love to know about because they are eager to learn. Blogger is one of the best platform that allows you do the unthinkable about blogging because 80% of the upcoming bloggers believe that blogging can only be done through the use of a desktop computer which is no.... Because the google blogger platform can be access through the use of Android phones today. 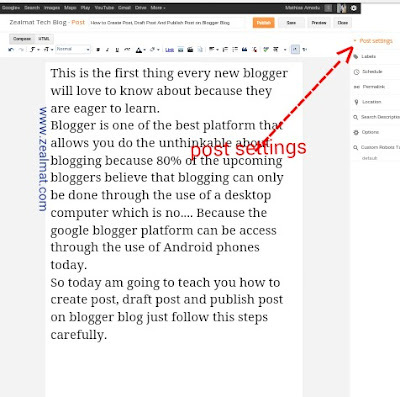 So today am going to teach you how to create post, draft post and publish post on blogger blog just follow this steps carefully. 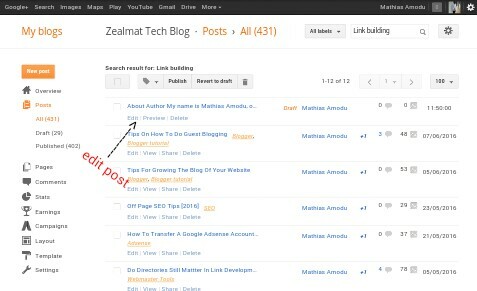 First click on "New Post" on your top left side of your dashboard. If you write a new post and click Save, it creates a draft part. so your post won't display on your live blog until you publish it. 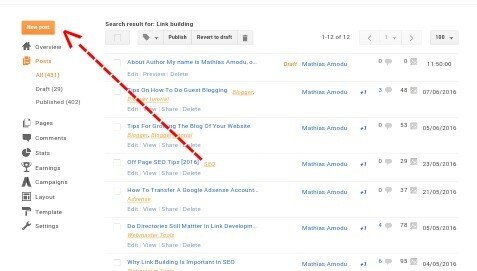 Again on your blog dashboard, click Posts. Now move your arrow at the title of the post and click Edit. 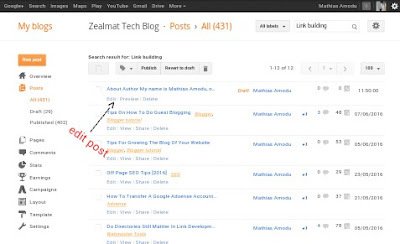 For a post to show on your blog, just click Publish. see how a post will look, click Preview. remove a post from your blog, click Revert to draft. delete a post, click Delete under the post title. Now check the right side of the Post Editor, click Post settings. Options: Choose to allow reader comments, how to compose posts, and add line breaks. Permalinks: Set the format of your links. Happy blogging if you will like to get your own well optimized blog feel free to contact me. this post is very interesting and useful. the information will help people in using this. I like the effective information you bestow in your articles. I’ll bookmark your blog and check yet again at this juncture recurrently. I’m quite definite I will hear several pristine stuff acceptably here! Clear good fortune for the next! Airport advertising in Agra ads are considered quality and also fashionable for providing exclusive product familiarity to customers. Have a glance at a few exclusive features of airport ads to recognize how they offer special brand experience to clients.